We've got a first here at Fash Boulevard, this week I simply could not decide which of these style mavens should be my Fash Fave. Blake Lively and Rachel Bilson arrived at the launch party for the Chanel Cruise Collection 2011/2012 killing it in two stunning ensembles. Blake wore a sequin blazer paired with a white blouse and a satin mini skirt from the Chanel Spring 2008 Haute Couture collection. She paired the look with a small black clutch and major grey Christian Louboutin pumps. The Gossip Girl starlet was caught snapping pictures of all the faint worthy runway looks with her iPhone during the show, mentally planning her upcoming appearance wardrobe, I'm sure. Magnum Ice Cream's new leading lady, Rachel B donned an uh-mazing blazer with a white tube top and black leather shorts paired with a quilted leather clutch and Christian Louboutin pumps. Casually chic meets perfection. Love these ladies and love seeing them in Chanel. Who do you think should be the Fash Fave? Rach or Blake? Something Extra: Check out some of the amazing pieces from the resort collection. I’m loving the black and white pieces in this collection. 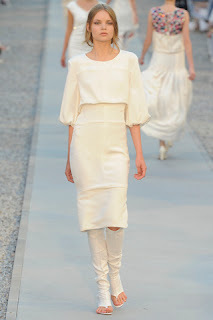 Totally classic Chanel designs. Which look is your favorite? Ya know, Blake's mew hair color is starting to grow on me. At first I wasn't such a fan...but the more pictures I see of her...the more I start to fall for it! to me they both look absolutely beautiful and fabulous! They both look amazing. I don't think I can pick either. Tie. Blake for sure! She's so gorgeous. Two of my favorite ladies, without a doubt! They're definitely huge style icons for our generation. Rachel Rachel Rachel! Bw her legs that go on for days, the leather shorts, the loubs, and her fab ombre waves...can I be her? Both of those girls look great! I can see why you couldn't pick just one. I love the collection. My favorite is that black and white swimsuit. It's so graphic! And Chanel collection? PERFECTION! 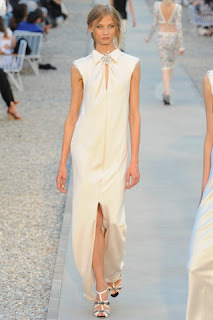 I love everything Karl makes, he´s genius!